Many of us are craving to experience today’s latest and fastest network of Globe Telecom on our device. Sad to say that not all of us can now taste the speed of Globe LTE as it’s only available on selected area and cities in Philippines. Lucky are those who lived on LTE covered area as they are closer to experience and enjoy fast cellular data internet connection. Some of us are trying to know few details about Globe LTE connections, like APN configurations, coverage area, device capability and other how to all can be found on Globe’s website. For your reference we’ll try to discuss few things about Globe Postpaid and Prepaid LTE. Afaik, LTE postpaid users used the APN: internet.globe.com.ph to connect on LTE covered area. This access point name is set by default to all postpaid users so no need for you to manually create this APN. Note you need to change the Network Mode also to LTE/WCDMA/GSM or LTE/CDMA. 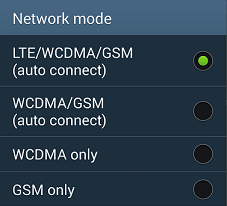 See sample How to Set LTE network mode on your Phone. That’s it guys, take note that Globe 4G/LTE is only available on selected areas. Please visit their website to list of area covered by LTE.